Our Best Answer - What is Bronco Copy N’ Mail? Bronco Copy 'n Mail, conveniently located on the first floor in the Bronco Student Center (Bldg. 35-1210), provides quality color and/or b&w printing, binding, copying, wide format signage, business cards, labels, tablecloths and mail services for students, faculty and staff at a reduced cost. 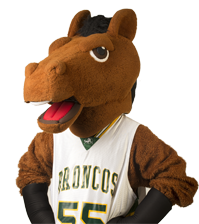 For information about hours, prices and services, go to the Bronco Copy ‘n Mail website.